For several centuries false Christian teachers have concentrated on ancient Greek and Hebrew manuscripts as the “original” texts dictated by Jesus via the Holy Spirit to ancient scribes. While this scenario is certainly a partial truth, there is now irrefutable evidence that the original Biblical text as Created by God is actually represented in its perfect and unchanging form in the KJV. We know very well based on High-quality Biblical scholarship that a) the KJV is the only Bible that contains the True™ Word of God (1) and b) that while many ancient papyri and vellum manuscripts are written in the Jooish or Greek scripts, Jesus knew very well God’s favorite language, American (2), and was probably fluent in its spoken form, as well. However, the academic community insists on the Greek and Jooish as being the “original” languages of the Bible. Here we demonstrate that, indeed, these languages are the ones used in the oldest existing manuscripts but, in fact, these old manuscripts are translations of the original American that God and Jesus intended to be the most accurate representation of their written Word. Based on best available data, there are now approximately 5,800 manuscripts of the New Testament written in the Greek language (3). This seems fabulous and exciting until we realize that these manuscripts are all different. There is not a single sentence in the Greek New Testament that would be exactly similar in all manuscripts. Thus, there is no single original Greek text that would irrefutably be the one dictated by Jesus! If we try to construct an original based on all these 5,800 texts, the chances of getting the correct version (assuming that it is not hidden in a manuscript that has not yet been found) is 1:1.79960751^19311! What does this mean? It means that the Greek texts are in fact the translations of an original that “has not been discovered”. We know very well that there are also claims of an Aramaic original (called the Peshitta ) but these claims are preposterous. Our conclusion: God would not make 5,800 different “original versions”. He would make only one. Instead, the Greek translators have made slightly different versions based on their personal preferences. This is supposed to be the "Greek original" of the Gospel of John. Initially, the Old Testament seems to be a more plausible case of Jooish origin. The number of divergent manuscripts is smaller, probably due to the meticulously obsessive-compulsive manner of the Jooish people in accounting, copying and raising interest. 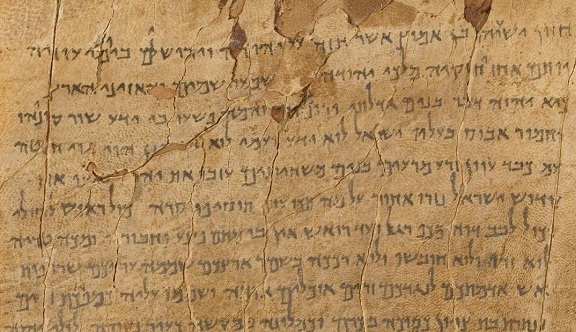 However, the Jooish “original” is actually the “Masoretic text”, which is an implausible Jooish attempt to unify the Old Testament during the 8th-10th centuries (5). They ADDED vowels that Jews did not know existed before that time. In addition, the Hebrew text and the Greek Septuagint (that is older) are very different. What does this mean? It means that the Hebrew one cannot be the original due to the additions! It is also in direct opposition to God’s commands! This is supposedly the "original old Masoretic testament". Our conclusion. Greek and Hebrew texts are the translations. The original must be somewhere else! Galatians 6:11 1 Ye see how large a letter I have written unto you with mine own hand. It is quite likely that these letters were in the American alphabet! I admit that there are a couple of chapters in the Bible that were not originally constructed in American in the hearts and souls of God and Jesus. In these cases, God states in a clear manner that these sentences are in the vernacular of the period: the Syriack language. This is understandable as these are some official documents cited in Ezra and some rousing stories told by the common people in Daniel. Here we can see our Lord Jesus on the cross crying out to the atheist Jooish peoples. In contrast to the manuscripts discovered in Grease or the Jooish lands, the KJV is a single document. It has been updated into modern American orthography in order to be readily understood by homers and other sinners. There are no 5,800 KJVs around. Only one. It is much more plausible that the original is one and the translations many than the other way round. There have been no additions to KJV unlike the Jooish texts. It is much more likely that false Christian or Jooish people would corrupt the Bible with additions than to believe that True Christian™ tradition would defile the original. Our conclusion: KJV is the one and only True™ word of God. Certainly, God transmitted the text for the ancients in their vernaculars but the KJV was not translated from these. It is the reconstruction of the pure Word of God that Jesus originally authored. Not until the days of King James was mankind ready to re-gain knowledge of God’s favorite language. The oldest written Bibles are Jooish or from Grease but the oldest Bible was in the mind of Jesus that THAT was in American! We are very lucky to live in an era that has, again, the original commands of Jesus available. Glory! Do we need the Grease and Jooish languages? We don’t need them for our own worship but it is prudent to learn them in order to be able to rebuke false Christian and atheist scholars who enjoy referring to these ancient translations. However, we can be confident that we have the original text at our disposal and it is our duty to spread the Good Gospel by using the Bible that Jesus and God wanted us to use at the very beginning of time and Creation! 1) Flint E (2008) Seven easy ways to tell the True Bible from the false ones. LBC Forum. http://landoverbaptist.net/showthread.php?t=10335. 3) http://www.csntm.org/. The site also tells how the National Library of Grease has almost 600 of these different manuscripts that are too different from each other to have been original. This also proves my point. 5) http://www.ecclesia.org/truth/ot_manuscripts.html. The study also shows that the Jooish language is most difficult, its meanings and grammar uncertain and it is devilishly ambiguous. In contrast, American can be understood by all True Christians™. KJV is the one and only True™ word of God. Amen to that Brother! I am certain all those unreadable Greek and Hebrew scribbles are just falsifications by Satan to mislead decent and honest Christians. I never understood any of this joo and greasy rubbish. AMERICA is God's chosen country, that much is obvious. All those greeks and jews are burning in hell. Why do I know this? Because it is written right here in my KJV, in God's favorite language; American! !